Paulist Press | Hardcover — Child’s Guide to Reconciliation is designed to reduce the anxiety that may occur with a first Confession by presenting God’s mercy as a gift available to us at anytime. Written on a child’s level with engaging color illustrations by Anne Catharine Blake, the book follows a girl named Claire as she receives the Sacrament of Reconciliation for the first time. Interactive questions throughout the book prompt further thought and discussion, making this book a perfect teaching tool for use at home, in Catholic schools or parish CCD classes. Just a great book for a child to read before his/her Reconciliation. Great for any Catholic child to read. Highly Recommended! 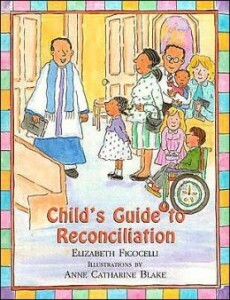 I just recently purchased the First Communion book By Elizabeth Ficocelli and I would highly recommend it for anyone who is making their First Reconciliation. I found it very informative and comforting for the reader. My son was quite nervous before he made his and after reading book he was able to understand what was going to happen. The book showed the child how special and important they were to God. As a parent I enjoyed the questions the book asked. It gave my son and I an opportunity to talk about how he was feeling and also brought back memories of the day I made mine. If you know of anyone who is making their First Communion, consider buying this book. It will be a great addition to your library. Amen for Child’s Guide to Reconciliation! As a Catholic, and a father of six children; it is important to me to provide my children with books that will reinforce their faith. My daughter, who is currently attending second grade in catholic school, was studying to make her Confession. Child’s Guide to Reconciliation reinforced what she had learned in school and helped her to have a greater understanding of the importance of the day. My daughter loves to read this book as it is well written and beautifully illustrated. The author provided examples to clarify the topics of both sin and repentance. The questions encouraged discussion between my daughter and I. This helped her prepare for the ceremony. The book is presented in such a way that it relieved and reduced the nervousness and anxiety my daughter was feeling. Next I will be looking for the child’s guide to Confirmation! I am a 2nd grade teacher and use this book to calm some of the fears my class has about Reconciliation. It is very kid-friendly as well as multicultural. The book walks the reader(s) through one child’s experience of Reconciliation. I highly recommend this to parents and teachers! I’m so glad I found it and will use it for years to come! My daughter was preparing for her first confession and this book was great. It helped her understand the difference between a sin and an accident. It describes the 10 Commandments in terms a young child can comprehend. The book is interactive with questions at the bottom of each page for the parents to ask. This helps reinforce the concepts and opens dialog between the parent and child.